Artist resin and china models are produced in limited runs in either resin or china. They are usually sold blank by the artist although some may be painted 'in house' and sold on. Obviously completed pieces can also be found for sale. They should be distinguished between commercial resin and china models which are mass produced by companies such as Beswick. Artist resin and chinas are not mass produced in a single colour and are usually created as a limited run (open editions do also exist). Artist Resin is often abbreviated to AR. Artist China may also be referred to as Custom Glazed China and could be seen as either AC or CGC. Also included in this definition are Artist Pewter. These are usually mini models and again are sold blank. The only difference is that they are produced in pewter not resin or china. The most common of these are Maggie Bennett Pewter minis. 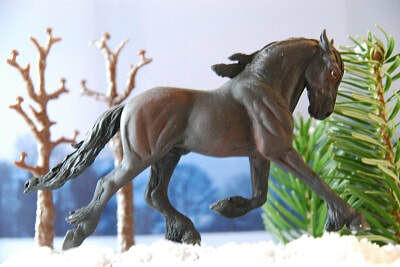 It is worth nothing that for the purposes of this article we have included Animal Artistry models as they are classed as Artist Resin & China in the UK. However, this is not the case in every country so please check your local rules before listening to anything I say! Some shows may also have separate Animal Artistry (AA) sections. When shopping for Artist Resins you will often see the terms 'raw' and 'clean' cast. These refer to the level of prep work that has been done in house before the model is sent to you, which you buy is entirely up to you and the amount of prep work you want to do yourself. When a resin is removed from the mould it will usually have heavy seams, possibly some air holes and will also have little stems from where the stand has been placed in the original casting. This is the raw cast resin (although some places do actually do a bit of tidying up even of raw casts). These models require a fair amount of prep work but are cheaper to purchase. A clean cast resin has been cleaned up by the artist. They will have removed all those heavy seams, lumps and bumps. Although they may still require a small amount of prepping it will be considerably less than a raw cast. These are pricier but will save you a lot of time and effort. The standard of raw and clean casts will vary from artist to artist. Some artists may have raw casts that are very much raw casts, whilst others may look much cleaner. It is usually obvious in online listings how much work is required. Seconds are models that are not perfect. They have usually come out of the mould with some form of damage that means that they cannot be sold at the same price as good quality casts. The quality of seconds will vary greatly depending on the artist and also the piece. Most artists will describe seconds in detail and price them accordingly. They can usually also be found for sale at shows from artists, an easier way to sell as the buyer can have a good look at the piece they are buying. A second could vary from anything from a few air holes to a missing limb. If you are prepared to put the work in they can be a cost effective way of getting an artist resin. Painted chinas or resins may also be sold as seconds where there are imperfections in the paintwork such as the example below. An Animal Artistry second - can you spot the mark? The painter and the sculptor are often two very different people. As most resins are sold blank you can find them painted by a huge variety of different artists. Many sculptors will also commission an artist to paint the first piece produced to use as a promotional image to show what the model could look like painted. It is also not uncommon to see pieces painted by the sculptor themselves or to see pieces painted 'in house' or through an artistic collaboration for sale on the artists website. Custom glazed and Artist Chinas are usually a little different in that they are almost exclusively sold painted. This is simply due to the nature of the medium. Companies such as Horsing Around frequently sell painted pieces. Some companies like Animal Artistry almost exclusively sell painted pieces (which is where the OF/AR distinction becomes a little murky - see the first paragraph for an explanation of why we included them here). You can of course also paint the piece yourself and lots of people do this. This is usually the cheapest option rather than buying painted pieces.